Cordyceps Sinensis – Cordyceps belongs to the family of numerous mushrooms, which are parasitic organisms growing wildly on various insects and anthropods in the high plateaus of China, Nepal, and Tibet. The spores of the fungi find a host in a population that has grown too large, and restores balance by taking over the host and growing a new mushroom. Marks have been found on fossilized leaves, suggesting the role of this fungus to take over it’s host has evolved more than 48 million years ago. Historically, Cordyceps were used in ancient China exclusively in the Emperor’s palace because they were so rare, however today they are wood grown and much easier to obtain. Cordyceps have properties that strengthen and rebuild the body after exhaustion or long-term illness. In Traditional Chinese Medicine, it’s action is related to the lung and kidney channels, and in China has been used as a tonic for the lungs and kidneys, to increase sperm production, increase blood production, anti-depressant, persistent cough, excessive tiredness, anemia, impotence and to reinforce Qi. It is also known medicinally to be a strong anticancer and anti-asthmatic agent. The authors in a 2001 study found that the efficacy of Cordyceps on arrhythmias had been proven beyond a doubt and that the specific mechanism by which it is attained may involve a stable membrane, reduction of Ca2+ overload and the reduction of free radicals. Cordyceps have traditionally been used to strengthen the kidneys and the lungs, and help reduce inflammation in the airways, reduce phlegm, while also restoring their function. It may increase the production of adrenal cortex hormones and help expand bronchial smooth muscles. A 2006 study looked at the effects of Cordyceps on the cellular immune functions of asthmatic children. In two groups of 40, both groups were given inhaled glucocorticoids, but the treatment group was also given Cordyceps. After 3 months, 75% of the treatment group had no symptoms, normal physical signs and lung function. Traditional Chinese Medicine attributes poor nutrition, irregular schedules, poor bowl habits, and stress/anger to atherosclerosis. Cordyceps increases the immune response of red blood cells, reduces inflammation, reduce circulating cholesterol and improves the activity of white blood cells. Cordyceps sinensis can help strengthen the immune system by stimulating natural killer cell activity. Uniquely, Cordyceps Sinensis has also shown the ability to impose bi-directional control, calming overactive immune systems and improving autoimmune diseases such as diabetes and lupus. A Japanese study in the 1990’s showed Cordyceps Sinensis to help against autoimmune disorders by calming and quieting the cells of the immune system. Additionally, the study reported significant sugar lowering effects from the cordyceps test group, with improvement in 95% of the test subjects. Cordyceps has been shown to reduce the growth of cancer cells in cases of sarcomas, melanomas and lymphomas. While the mechanism is still unknown, Cordyceps have continually been shown to increase immunity, which fights cancer reproduction. In one study done in 1993, researchers found that Cordyceps had a direct impact on laryngeal carcinoma cells, with higher concentrations of Cordyceps reduced growth rate. In 1998, a Cordyceps extract was found to have a strong inhibitory effect on both spontaneous liver metastasis of Lewis lung carcinoma and B16 melanoma cells in mice. In one study, an orally administered hot-water extract from Cordyceps sinensis (CS), protected mice from bone marrow and intestinal injuries after total-body irradiation (TBI). According to WebMD, “Cordyceps might improve immunity by stimulating cells and specific chemicals in the immune system. It may also have activity against cancer cells and may shrink tumor size, particularly with lung or skin cancers. *Cordyceps may increase estrogen and testosterone, and therefore should not be used with hormone dependent cancers (breast and prostate). Cordyceps have been found to lower blood glucose levels and increase blood serum levels, however the mechanism remains unknown. In 2000, subjects were given Cordyceps and other herbs 5 minutes before meals for a period of 6 months. The results found that 48.3% of the subjects showed marked improvement, 41.9% showed improvement, and only 9.7% showed no improvement. Cordyceps are best known for their ability to increase stamina and as an anti-fatigue supplement. They increase oxygen in the body, which is much different than a stimulant. The difference is that you find yourself being able to keep a pace all day long without crashing, but still sleeping soundly. For this reason, they are very popular with athletes who want to increase their endurance. In a 2004 study, researchers found that Cordyceps improved the capacity of a subject to exercise and increased resistance to fatigue. Chronic Fatigue Syndrome in Traditional Chinese Medicine is looked as a dysfunction of the organs, most notable the liver. The liver is connected to the sinews, and when the liver stops working correctly, muscle fatigue sets in. Negative emotions affect the liver, which in turn affects the lungs, heart, kidneys and spleen. Traditional Chinese Medicine looks at erectile dysfunction due to kidney dysfunction caused by excessive fear, as well as heart and spleen deficiency caused by excessive thinking and worry. Cordyceps have been used for ED for an estimated 2000 years. It has been shown to act as a kidney tonic, thus improving erectile function and replenish sperm count. In 1995, one impressive study found that 66% of subjects given Cordyceps showed improvement for impotence vs. 23% given a placebo, 67% showed improvement for seminal emission vs. 0% given a placebo, and 67% showed improvement in libido vs. 0% given a placebo. For women, Cordyceps improved 86% of the subjects vs. 0% of the placebo group. Cordyceps also showed 100% improvement for women with other sexual dysfunction vs 0% in the placebo group. In multiple studies, Cordyceps have helped normalize liver enzymes, inhibit steatohepatits derived from nonalcoholic fatty liver disease by lowering serum and tissue TNFa, reducing the over-expression of UCP2, and inhibit hepatic fibrogenesis derived from chronic liver injury as well as retard the growth of cirrhosis. Researchers say that Hepatitis B infects 350 million people worldwide and is the number one cause of liver cancer and cirrhosis of the liver. It’s estimated that 50% of the population will contract the disease in their lifetime. Clinical trials lead scientists to believe that Cordyceps Sinensis supplements can increase one’s ATP levels (an essential enzyme the helps the liver regenerate) and help those suffering from hepatitis B and liver damage. Researchers also believe that Corcyceps Sinensis can control a patient’s liver fibrosis, strengthen a hepatitis C patient’s immunity function and anti-oxidation ability. In 1990, 32 hepatitis B patients were administered 3.750mg of cordyceps sinensis daily for 30 days. 21 patients (66%) showed signs of the antibodies for the virus change from positive to negative, while 23 patients (72%) showed improved liver function. 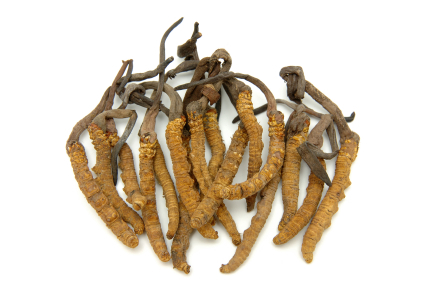 Cordyceps proved to be beneficial to patients suffering from post hepatitis cirrhosis. In a study on 14 patients, with alcohol included liver steatosis, supplementation with Cordyceps at 3g/day resulted in a 70% reduction in AST, a 63% reduction in ALT and a 64% reduction in GGT over a 90 day period. Animal studies also show that Cordyceps can inhibit alcohol-induced hepatic fibrogenesis, retard the development of cirrhosis and improve liver function. In a study with mice that had Lupus, one group was given Cordyceps while the other group was not. The survival rate of the control group showed a survival rate of 0% after 8 months, while the group that used Cordyceps showed a survival rate of 75%. After 6 months, the negative percentage of anti-ds DNA was measured, with 43% for the control group, and 87.5% for the Cordyceps group. In a human study involving 51 patients with chronic renal failure, the administration of3-5g per day of Cordyceps to 28 patients improved renal and immune function. In 23 cases of tinnitus treated with an infusion of Cordyceps, eight were reported as cured and nine significantly improved, while six found no improvement. The researchers concluded that Cordyceps was effective for tinnitus caused by fluid accumulation in the middle ear, while it was ineffective in cases with a long history of auditory nerve disorder. We highly recommend buying a high quality brand of Cordyceps that uses hot water extracts, like those used in all of these studies. This can be found in office or online store. I recommend only using hot water extracts of Cordyceps because these are the ones used in studies. The best one I have found is Cordyceps CS4 from Mushroom Science. 1. Valkov, Nathalie PhD, L.Ac Cordyceps: Treating Diabetes, Cancer and Other Illnesses. 2010. 2. Hobbs, Christopher Hobbs L. Ac. Medicinal Mushrooms. Book Publishing Company. 1986. 3. Liu WC et al. Protection against radiation-induced bone marrow and intestinal injuries by Cordyceps sinensis, a Chinese herbal medicine. Radiat Res. 2006 Dec;166(6):900-7.